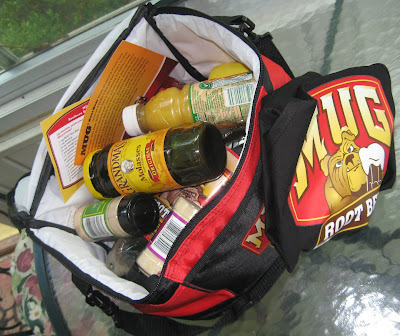 Mug Root Beer generously offered five giveaway packs for readers of Barbecue Master. And, for the record, they didn't ask for anything in return (not even a link - although I'll provide one so readers can check out more recipes and also see where the gifts came from). 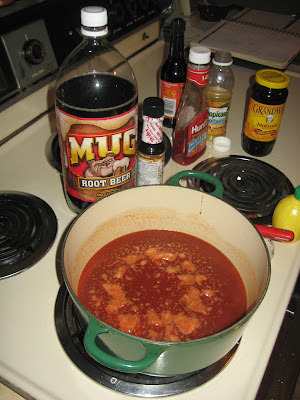 Above, you'll see the cooler, apron, and the ingredients for the Mug Root Beer barbecue sauce which is listed at Mug Root Beer (under the recipe link). It all fits in there neatly. 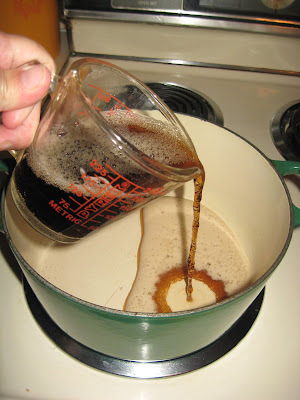 I'd just been jumbling in the kit and getting ready to make up some root beer barbeque sauce. If you haven't entered to win one of the Mug Root Beer cooler packs, be sure to check the giveaway entry post. The deadline is June 20, 2009. You can always make up the sauce on your own, but getting the ingredients plus a cooler to keep is a sweet deal. 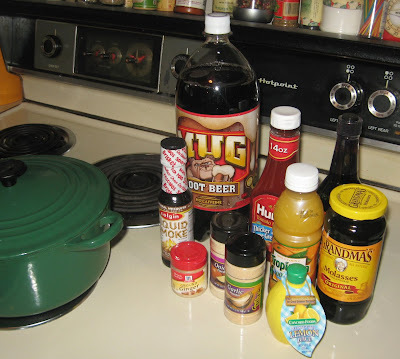 I got all the ingredients out to make the Mug Root Beer barbecue sauce. As you can see, they combine quite a few ingredients to come up with a unique and tasty barbecue sauce. Also, the amounts are generous, so we've had extras with the boys enjoying glasses of root beer all day. The base for the barbcue sauce is . . . root beer . . . of course. Root beer, for anyone who doesn't know, is a soft drink. The name comes from the fact that it looks like a dark ale. The flavor is sweet with a herbal kind of bite. This is also a soft drink that does not have caffeine, and it's also gluten free. Although there are a number of ingredients in the sauce, the recipe is simple. Simply put all the ingredients in a sauce pan and simmer for around 20 minutes or until the sauce is reduced. In other words, you steam it down a bit until it thickens a bit. Do note that this is not a real thick sauce. It's a little thicker than what we call a barbecue mop around here. Today I cranked up the Traeger wood pellet smoker grill. I put a small Hormel ham on for earlier in the day and some ribs on for later. 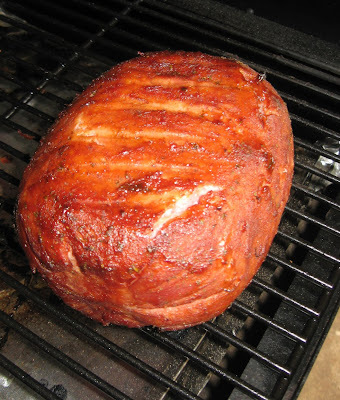 The ham was pre-cooked, so I just spritzed it with apple juice for moisture and then sauced it about 10 minutes on each side right near the end of the grilling time. All total, the ham smoked on medium for around an hour. We had two very nice barbecue meals today - first ham and then country style pork ribs.